Anyone who follows Medeski Martin & Wood knows that besides being one of the world's most ambitious and unique drummers, Billy Martin has a long standing interest in the visual arts. Check out MMW's iconic logo, Shack-man's cover art or the gallery on billymartin.net for evidence. He has also recently begun experimenting with film and has created a number of music videos and short films. Now comes his first feature length film, Billy Martin's Life on Drums. Much more than an instructional drumming video, the 153-minute Life on Drums is an experimental film bursting with inspired music and creative film techniques (full disclosure: my pal Matt McClain is the film's Director of Photography -- see his work here). Luckily the film is also grounded with narrative. 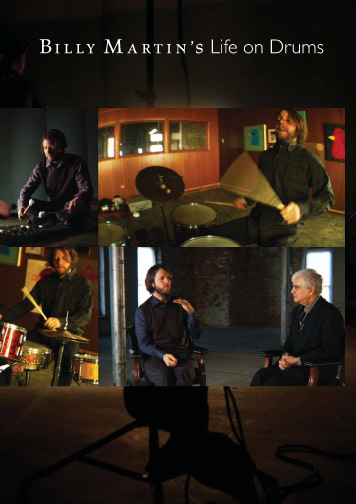 Between Billy's lessons, compositions and inspired solos are intimate conversations between Billy and his first drum teacher, the charming Allen Herman. Allen is from the old-school and has truly lived his life behind the kit. He shares, and undoubtedly influenced, Billy's open-minded attitude towards music. Allen and Billy have clear chemistry and as a result their conversations are genuinely interesting whether discussing specific drumming techniques or their broader attitudes towards the creative process.